Some car makers seem to have forgotten what people love about SUVs, namely the room for cargo or passengers. The 2018 Ford Explorer is not one of these SUVS. It gives drivers room for seven and towing capability for any trip. It holds its position as one of the best vehicles on the market today. How does it compare to the five-passenger GMC Terrain? The 2018 Ford Explorer has a slightly higher MSRP, but it comes with tons of standard features that cost extra in the GMC Terrain. Those extra features add up quickly in the GMC Terrain. The 2.3-liter I4 engine of the 2018 Ford Explorer has similar efficiency specs as the 2.0-liter Turbo of the GMC Terrain, but the Ford Explorer gives you a much greater cruising range on one tank of gas. Spend less time at the pump and more time enjoying your new Ford Explorer. The Ford Explorer is made for, well, exploring. Each of the three engine options packs a punch that you won’t find in the GMC Terrain. This extra power makes for a more fun and responsive drive, but also allows you to tow up to 5,000 pounds in the Ford Explorer. The GMC Terrain has to be outfitted with expensive accessories to muster 3,500 pounds of towing capacity. The biggest feature that the 2018 Ford Explorer has that the GMC doesn’t is the third row of seating. The GMC Terrain has much less room not only for passengers, but for all the items necessary for a great family vacation. 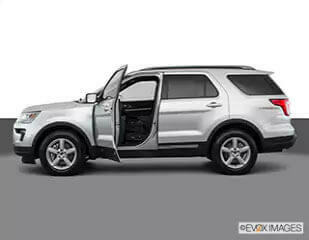 More than just comfort, the Ford Explorer has features like adaptive cruise control that make driving easier and safer. This feature can’t be found in the GMC Terrain. Experience Everything the 2018 Ford Explorer Offers Today! Come down to Reynolds Ford of Norman to see all of the great vehicles and services we have in store for you!